With all the hoopla going on about the food available in schools, sometimes packing lunch makes sense. Packing lunch allows parents to have more control over the food and nutrition for our kids (it can also save a bit of moola too.) While brown bags are often the go-to lunch tote, it’s not as green or as eco-friendly as reusable storage options. Rubbermaid has come up with a new solution for keeping our lunches organized and un-smooshed with their new LunchBlox Sandwich Kit. 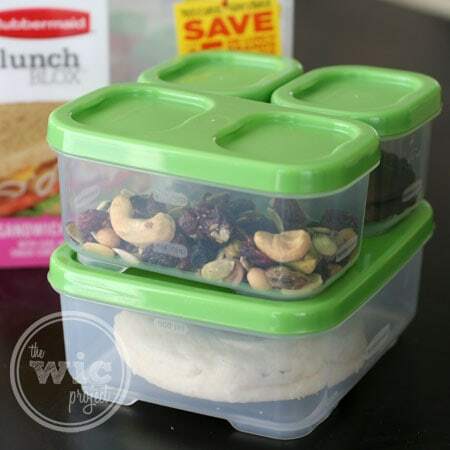 The LunchBlox Sandiwch kit consists for 4 conveniently sized containers to will allow you to store a range of tasty lunch treats and food. It also includes a Blue Ice pack which helps keep your lunch cool while you’re out and about. One of the great things about the Rubbermaid LunchBlox is that you can use or assemble the kit however you want. 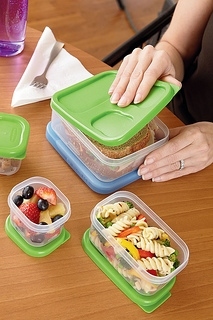 The different pieces have convenient snap-lid systems that allow you to snap one container into the lid of of another, creating a “block” of containers that is easy to store and transport. The two snack containers are 1/2 cup sized and are perfect for cookies, trail mix, or other smaller snack-sized items. For veggies or even small sides, you can use the side container, which is 1.2 cup sized. Finally, the large sandwich container is the perfect size for full-sized sandwiches. You can stack the containers in a variety of different ways. If you’ve got your salad or perishable items in the sandwich container, you can attache the Blue Ice to the bottom and snap the snack and side containers on top. Or, if you want to keep all four containers cool, you can snap the Blue Ice pack in the middle. All containers still can snap into each other so your containers are a secure block. That’s one of the things that makes the Rubbermaid LunchBlox so cool (literally) – you can arrange the containers however you want and keep yours or your kids’ lunches well organized, cool, and smoosh-free. The containers are also microwave-safe, dishwasher-safe, freezer-safe, and BPA-free. 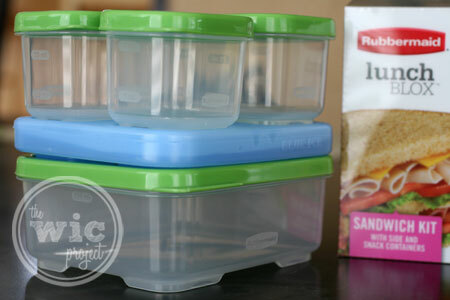 If you’d like to use the Rubbermaid LunchBlox for your family’s lunches, you can by the LunchBlox sandwich kit online at Rubbermaid.com, at stores near your, or online from Amazon.com for just $13.64. 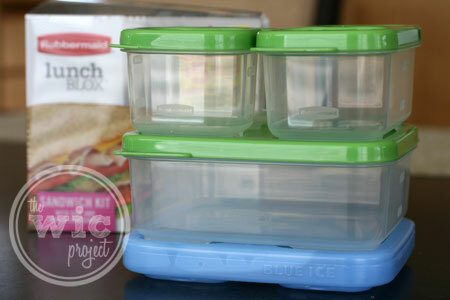 One winner will receive thew new Rubbermaid LunchBlox Sandwich Kit. Giveaway is open to eligible US and Canada residents. I like that it is stackable and separete. I love that it has a snap on ice pack since my daughter LOVES her salads. Looks like these lids snap on much more secure so no accidental spills or mess. I like it,but,I have been a rubbermaid lady for many years,just because the quality is there. I like the ability to carry a sandwich without squishing it. I like that I can stack the lunch items on top of one another, and that I can see what is inside the lunchbox! Nice lunchbox! I like how compact it is and how the lids function as par of the whole unit. I love how easy it seems to make them stackable! I like that it can be used by both kids and adults. I like that I know my sandwich won’t get all mashed up. I like the ice pack that fits with it, so much better then the bulky ice packs that take up to much room. I like that the Blue Ice attaches. I like its convenient size it should easily fit the lunchboxes I have now! they keep everything tidy and organized in cupboard to! I love that it keeps everything seperated and stacks. I like all the sizes. i love the see threw look , the stackability, the easy find lids, you name it i love it lol!!! I like that it all nicely fits together! I like that it fits and snaps on so I don’t have to worry about it toppling over! I like that it snaps together and comes with an ice pack. Having a snap on ice pack is awesome. I like that it is separate and stackable. connie danielson. would like to say thank you for this wonderful, giveaway! I love, love, love that these work easily with an ice pack! I love that everything stays where it’s supposed to. No more squished items by lunch! I like that it stacks on top of each other and you can easily see inside. I like that sandwiches won’t get smushed (my kids’ complaint), and everything stays contained and organized (my must-have for lunchboxes). There’s so much to love!! It’s BPA free, I love how it fits neatly together, it’s microwave, dishwasher and freezer safe! My youngest is starting preschool on Thursday, this would be perfect for her! Thank you and Good Luck to everyone!! I love that it is so versatile and it comes with an ice pack. That’s awesome! I love it’s BPA free, it’s microwave, freezer and dishwasher safe. It’s nice that all the pieces fit together. My youngest is starting preschool on Thursday, this would be perfect for her! Thank You and Good Luck to everyone! I like that there are smaller containers with this set and they all fit together. I like that the kit comes with an ice pack to keep food cold! Thanks. I love how it is in a good size for a sandwich and snack sizes. they are microwave-safe, dishwasher-safe, freezer-safe, and BPA-free. I make a sandwich for lunch every day for work, it would save me a lot of money and I would waste less having to buy less plastic bags. I really like that these are BPA free and can be washed in the diswasher. It would be easy to pack my hubby’s lunch and keep it organized. I love how they snap together! What a neat concept!!! I will use this! I love they all fit together, including the ice pack! Very clever! No need for plastic bags in lunch! I love that it’s convenient, and would fit perfect in my son’s lunchbox. I love that they all fit together with the ice pack. And it’s nice that all your food would be in separate containers! Plus, it’s reusable and you wouldn’t be wasting plastic bags in lunches. I like that it is easy to store and transport. I like the blue ice pack and that they are BPA free. I like the variety of sizes, and My Grand daughter packs her lunch all the time, she would love them. I love that it is Dishwasher safe and that it stacks and stays together! Thanks for the giveaway! I like the separate containers and the ice pack come with it. I like the icepack that they snap into! I like that they’re freezer safe! the snap on ice pack! I like the varying sizes to keep things fresh! I like that you can configure them as you need. I like that it can keep lunch chilled. I like that they are freezer and microwave safe! I like that it can hold food for each food group. I love that it’s microwave safe. Thanks for the awesome giveaway! I love that you can keep it cold and not have to worry about a smooshed sandwich!! I like the blue ice. I wish I had thought of that. I like the ice pack that fits between the containers – Thanks! Ice pack makes it great for travel as well and the styling is nice! It’s more environmentally friendly than brown bags and baggies! I can’t wait to put my lunch in it and keep it cool! I have 4 grandsons. It would be a big help to win one, therefore I would only need to buy three. Thanks for this opportunity. i love how you can stack the containers and choose how you want to organize them, great idea ! I like the way they stack and that you can ose the ice pack and they still stack nicely. Thank you for this amazing giveaway, love the way they keep in freshness, seal, and keep things from getting smashed. I love this. This set reminds me of the japanese bento box or India’s lunch boxes in which everything is packed separately for food safety, freshness and to keep the tastes individual and separate. So convenient. I want to win! i like that there is a compartment for everything. It’s super organized which appeals to me. I like that everything fits together, including the ice block! Love that it has the ice pack with it. It has different sizes so it will accomadaite different size portions. I like the ice pack & the way they stack! I like the ice packs. Great idea. It will keep the hubby’s lunch neat and tidy during his dirty day! Love the blue ice pack and the snapping concept. would love the green ones! I love that my food won’t get mixed together in the shuffle! This containers look great. They would be perfect for my lunch. They are easy to use for small children and keep their food separated. I like that there are various sizes in one kit. 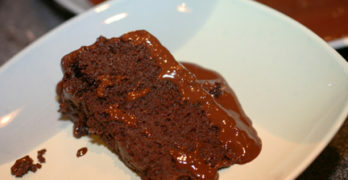 i love the fact its portion controlled,i really need that!!! I could so use these!!! It would keep my husbands lunch dry and put together in the coolers he carries to work for lunch and break everyday! I like that you don’t have to use a bunch of baggies! I love that this is eco friendly and sandwiches won’t get smushed!!! I like the blue ice attachment! I like that they are reusable and don’t squish the food. eliminates baggies, and no squishing of food!!! I love the fact that there is no more guessinng what is in the lunch. With the clear containers, you can see what, and for whom, the food is intended. This is very nice and odd! !